A recent study published in the Lancet Diabetes and Endocrinology journal, showed that sufficient and adequate Vitamin D levels may reduce the risk for another miscarriage in patients having suffered previous losses. At Braverman Reproductive Immunology, we have been diagnosing and treating Vitamin D deficiency for years that appears to be prevalent in our patients with Recurrent Pregnancy Loss. Deficiency of Vitamin D also appears to play a significant role in the propagation of autoimmune and inflammatory disorders also seen commonly on our patient population. In this blog, we will give you a clear insight of what is known about miscarriage risk, autoimmunity (including endometriosis) and obstetrical complication in relation to Vitamin D.
a. What is vitamin D? Vitamin D2 (ergocalciferol) that you can get through your diet. Vitamin D3 (cholecalciferol) that you synthetize after sun exposure and represent 95% of your vitamin D production (1). As shown in the Figure 1 below, these precursors bind to a binding protein (VDBP) to transit in the blood and reach the liver where they are modified into calcidiol (25-OH cholecalciferol) then metabolized a second time by the kidney to generate calcitriol (or 1, 25 dihydroxycholecalciferol), the active form of vitamin D.
Regulation of apoptosis (cell death) Vitamin D and its receptor are present in the ovaries (2) where they stimulate the production of the steroid hormones estrogen and progesterone (3). The endometrium (uterus) itself can synthesize the active form of Vitamin D (4) and express the vitamin D receptor VDR as well (2). In the recent study from the Lancet journal, included N=1200 women with one or two prior miscarriages, they followed them for up to six menstrual cycles while attempting pregnancy and throughout pregnancy if they conceived. Their Vitamin D levels were measured at baseline (preconception) and at 8 weeks of pregnancy (if they have conceived). The results showed that women with sufficient preconception vitamin D were more likely to achieve clinical pregnancy and livebirth as compared to women with insufficient Vitamin D concentrations. Among women who achieved pregnancy, sufficient preconception vitamin D (>30 ng. mL-1) was associated with reduced risk of pregnancy loss. This study is very important as it shows that a sufficient preconception vitamin D level is associated with better chances for a pregnancy (+10%) and a livebirth (+15%) and a reduced risk for another pregnancy loss. Low levels of vitamin D are common in pregnant women and has been shown in several epidemiological studies worldwide. Vitamin D deficiency is associated with an increased risk of infection (5), bacterial vaginosis (6), pre-eclampsia (7) and low serum vitamin D levels in the newborn (8). Many evidences support the beneficial role of vitamin D in promoting women reproductive health and fertility. Studies in animal (9) and in human (10) have shown that Vitamin D is a potent regulator of a process named decidualization that corresponds to the preparation of your uterus (with modification of endometrial cells) for the establishment of a pregnancy. Therefore, a vitamin D deficiency may negatively impact your uterine lining. A condition we commonly see in our own patient population. Vitamin D is a main regulator of a gene named HOXA10, essential for the regulation of the endometrial development and receptivity during the window of implantation (11). Lower expression of HOXA10 was found in the endometrium of ENDO patients (12) and could be due to lower vitamin D levels thus playing a role in ENDO patient’s infertility. A reason why our treatments likely treat the defects found in tests such as the ERA (Endometrial Receptivity Assay). urther, vitamin D regulates genes involved in trophoblast invasion and angiogenesis, key mechanism in embryo implantation and placenta function, thus supporting fetal growth and development (13-15). In addition, in vitro experiment on NK cells showed that IFN-γ and TNF-α secretion from NK cells were significantly decreased (P < 0.01 each), and IL-10, IL-1β, vascular endothelial growth factor (VEGF) and granulocyte colony stimulating factor (GCSF) levels were significantly increased (P < 0.01 each) with vitamin D when compared with those of controls. These are all changes that promote tolerance of the maternal immune system to the foreign genetics on the embryo. These data clearly show the great benefits of Vitamin D that decreases inflammation leading to a more tolerogenic environment and inducing angiogenesis to support embryo implantation. A study comparing n=1385 cases of ENDO proven by laparoscopy to over 69 000 disease-free women (The Nurse Health Study) showed that women in the highest quintile for vitamin D have 24% lower risk of endometriosis than those in the lower quintile (17). These results, without proving any causality between vitamin D levels and endometriosis, showed a strong association between low levels of Vitamin D and the occurrence of endometriosis. To learn more about Vitamin D impact on endometriosis and how Vitamin D can help reduce endometriotic lesions, read our blog on the topic. Adequate intake of vitamin D during pregnancy is very important for both maternal and infant’s health. Vitamin D plays an important role in the modulation of the immune function (18) and oxidative stress (19) with dramatic impact on fertility ranging from poor oocyte quality, miscarriage to pregnancy complication including pre-eclampsia, preterm labor and stillbirth (16,18, 20). Inhibition of a master regulator of gene expression (NFB) which leads to the suppression of chemokine production by cells in the organ targeted for inflammation (24). At Braverman Reproductive Immunology, we are constantly studying the latest discoveries in the field of reproductive immunology and promoting their use to offer you better diagnostic, monitoring and treatments. There is a high prevalence of vitamin D deficiency in our patient population suffering from reccurent pregnancy loss and this has to be corrected prior to conception. We are systematically determining your Vitamin D levels and if appropriate, we recommend supplementation to replenish your vitamin D reserve and optimize your chances of having a healthy pregnancy. 1-	Holick MF. Vitamin D deficiency. N Engl J Med. 2007 Jul 19;357(3):266-81. Review. 2-	Agic A, Xu H, Altgassen C, Noack F, Wolfler MM, Diedrich K, Friedrich M, Taylor RN & Hornung D. Relative expression of 1,25-dihydroxyvitamin D3 receptor, vitamin D 1a-hydroxylase, vitamin D 24-hydroxylase, and vitamin D 25-hydroxylase in endometriosis and gynecologic cancers. Reproductive Sciences 2007 14 486–497. 3-	Parikh G, Varadinova M, Suwandhi P, Araki T, Rosenwaks Z, Poretsky L & Seto-Young D. Vitamin D regulates steroidogenesis and insulin-like growth factor binding protein-1 (IGFBP-1) production in human ovarian cells. Hormone and Metabolic Research 2010 42 754–757. 4-	Vigano` P, Lattuada D, Mangioni S, Ermellino L, Vignali M, Caporizzo E, Panina-Bordignon P, Besozzi M & Di Blasio AM. Cycling and early pregnant endometrium as a site of regulated expression of the vitamin D system. Journal of Molecular Endocrinology 2006 36 415–424. 5-	Gunville CF, Mourani PM, Ginde AA. 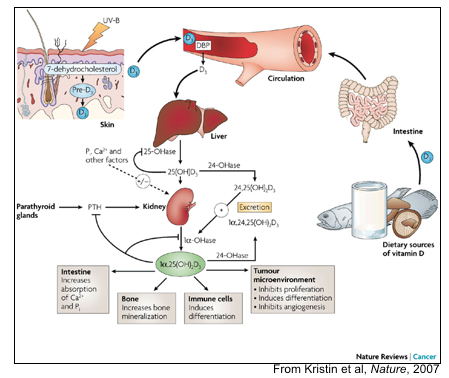 The role of vitamin D in prevention and treatment of infection. Inflamm Allergy Drug Targets. 2013 Aug;12(4):239-45. Review. 7-	Sablok A, Batra A, Thariani K, Batra A, Bharti R, Aggarwal AR, Kabi BC, Chellani H. Supplementation of vitamin D in pregnancy and its correlation with feto-maternal outcome. Clin Endocrinol (Oxf). 2015 Oct;83(4):536-41. 8-	Rodda CP, Benson JE, Vincent AJ, Whitehead CL, Polykov A, Vollenhoven B. Maternal vitamin D supplementation during pregnancy prevents vitamin D deficiency in the newborn: an open-label randomized controlled trial. Clin Endocrinol (Oxf). 2015 Sep;83(3):363-8. 9-	Halhali A, Acker GM, Garabédian M. 1,25-Dihydroxyvitamin D3 induces in vivo the decidualization of rat endometrial cells. J Reprod Fertil. 1991 Jan;91(1):59-64. 10-	Zerwekh JE, Breslau NA. Human placental production of 1 alpha,25 dihydroxyvitamin D3: biochemical characterization and production in normal subjects and patients with pseudohypoparathyroidism. J Clin Endocrinol Metab. 1986 Jan;62(1):192-6. 1,25-(OH)2D3 in human myelomonocytic cells and human endometrial stromal cells. Mol Endocrinol. 2005 Sep;19(9):2222-33. 12-	Deng KX, Liu XC, Zheng YH, et al. Expression and significance of HOXA10 gene in the eutopic and ectopic endometrium of endometriosis. Zhonghua Fu Chan Kke Za Zhi 2011; 46:813–6. 13-	Shin JS, Choi MY, Longtine MS, Nelson DM. Vitamin D effects on pregnancy and the placenta. Placenta. 2010;31(12):1027-1034. 14-	Nguyen TP, Yong HE, Chollangi T, Borg AJ, Brennecke SP, Murthi P. Placental vitamin D receptor expression is decreased in human idiopathic fetal growth restriction. J Mol Med (Berl). 2015;93(7):795-805. 15-	Chan SY, Susarla R, Canovas D, et al. Vitamin D promotes human extravillous trophoblast invasion in vitro. Placenta. 2015;36(4):403-409. 16-	Ota K, Dambaeva S, Han AR, Beaman K, Gilman-Sachs A, Kwak-Kim J. Vitamin D deficiency may be a risk factor for recurrent pregnancy losses by increasing cellular immunity and autoimmunity. Hum Reprod. 2014 Feb;29(2):208-19. 17-	Harris HR, Chavarro JE, Malspeis S, Willett WC, Missmer SA. Dairy-food, calcium, magnesium, and vitamin D intake and endometriosis: a prospective cohort study. Am J Epidemiol. 2013 Mar 1;177(5):420-30. 18-	Ji JL, Muyayalo KP, Zhang YH, Hu XH, Liao AH. Immunological function of vitamin D during human pregnancy. Am J Reprod Immunol. 2017 Aug;78(2). 19-	Farhangi MA,Mesgari-Abbasi M, Hajiluian G, Nameni G, Shahabi P. Adipose tissue inflammation and oxidative stress: the ameliorative effects of vitamin D. Inflammation. 2017;40(5):1688-1697. 20-	Pourghassem Gargari B, Pourteymour Fard Tabrizi F, Sadien B, Asghari Jafarabadi M, Farzadi L. Vitamin D Status Is Related to Oxidative Stress But Not High-Sensitive C-Reactive Protein in Women with Pre-Eclampsia. Gynecol Obstet Invest. 2016;81(4):308-14. 21-	Adorini L, Amuchastegui S, Daniel KC. Prevention of chronic allograft rejection by Vitamin D receptor agonists. Immunol Lett. 2005 Aug 15;100(1):34-41. Review. 22-	Cippitelli M, Santoni A. Vitamin D3: a transcriptional modulator of the interferon-gamma gene. Eur J Immunol. 1998 Oct;28(10):3017-30. 23-	Helming L, Böse J, Ehrchen J, Schiebe S, Frahm T, Geffers R, Probst-Kepper M, Balling R, Lengeling A. 1alpha,25-Dihydroxyvitamin D3 is a potent suppressor of interferon gamma-mediated macrophage activation. Blood. 2005 Dec 15;106(13):4351-8. 24-	Giarratana N, Penna G, Amuchastegui S, Mariani R, Daniel KC, Adorini L. A vitamin D analog down-regulates proinflammatory chemokine production by pancreatic islets inhibiting T cell recruitment and type 1 diabetes development. J Immunol. 2004 Aug 15;173(4):2280-7. 25-	Asemi Z, Samimi M, Tabassi Z, Shakeri H, Esmaillzadeh A. Vitamin D supplementation affects serum high-sensitivity C-reactive protein, insulin resistance, and biomarkers of oxidative stress in pregnant women. J Nutr. 2013 Sep;143(9):1432-8. 26-	Zabul P, Wozniak M, Slominski AT, Preis K, Gorska M, Korozan M, Wieruszewski J, Zmijewski MA, Zabul E, Tuckey R, Kuban-Jankowska A, Mickiewicz W, Knap N. A Proposed Molecular Mechanism of High-Dose Vitamin D3 Supplementation in Prevention and Treatment of Preeclampsia. Int J Mol Sci. 2015 Jun 9;16(6):13043-64. 27-	Xu J, Jia X, Gu Y, Lewis DF, Gu X, Wang Y. Vitamin D Reduces Oxidative Stress-Induced Procaspase-3/ROCK1 Activation and MP Release by Placental Trophoblasts. J Clin Endocrinol Metab. 2017 Jun 1;102(6):2100-2110. 28-	Arnold DL, Enquobahrie DA, Qiu C, Huang J, Grote N, VanderStoep A, Williams MA. Early pregnancy maternal vitamin D concentrations and risk of gestational diabetes mellitus. Paediatr Perinat Epidemiol. 2015 May;29(3):200-10. 29-	Asemi Z, Samimi M, Tabassi Z, Shakeri H, Esmaillzadeh A. Vitamin D supplementation affects serum high-sensitivity C-reactive protein, insulin resistance, and biomarkers of oxidative stress in pregnant women. J Nutr. 2013 Sep;143(9):1432-8. 30-	Asemi Z, Hashemi T, Karamali M, Samimi M, Esmaillzadeh A. Effects of vitamin D supplementation on glucose metabolism, lipid concentrations, inflammation, and oxidative stress in gestational diabetes: a double-blind randomized controlled clinical trial. Am J Clin Nutr. 2013 Dec;98(6):1425-32.